Pacific Ethanol Inc. announced it is now producing cellulosic ethanol at its Stockton, California, facility using Edeniq Inc.'s pathway technology, which converts corn kernel fiber to fermentable sugars. Members of Congress have passed a $1.1 trillion spending bill and accompanying legislative package of tax extenders that includes two-year extensions of tax credits that benefit biofuels and bioenergy. President Obama is expected to sign the bill. For the second time in history, the U.S. ethanol industry’s daily average production has reached 1 million barrels per day. Ethanol production averaged 1 million barrels per day the week ending Dec. 11, nearly meeting the record set in November. The Federal Trade Commission has issued its 2015 Report on Ethanol Market Concentration. As in prior years, the report concludes that any unilateral or coordinated attempt to exercise market power in the U.S. ethanol industry is highly unlikely. The National Renewable Energy Laboratory has released its 2014 Data Book, showcasing increased use of renewable energy. According to the report, renewables accounted for approximately 11.1 percent of U.S. energy production in 2014. The U.S. Grains Council's ethanol export promotion program has seen an early success with a U.S. exporter confirming sales of 10 million gallons of U.S. ethanol to Peru, valued at more than $15 million, following a trade team's visit. Federal lawmakers have released the text of a $1.1 trillion spending bill that will fund the U.S. government through October 2016. An accompanying legislative package of tax extenders aims to extend certain bioenergy tax incentives for two years. Joule and HeidelbergCement have announced a partnership to explore application of Joule's technology to mitigate carbon emissions in cement manufacturing. The partnership could result colocation of Joule's technology at HeidelbergCement sites. In mid-December, Kum & Go and Growth Energy are partnering to bring E15 to the residents of Greater Little Rock, Arkansas. During two promotions, customers can fuel up with E15 for only $1.15 per gallon, as well as learn more about the fuel blend. Chempolis Ltd. has entered into partnership with Avantha Group's research wing Avantha Centre for Industrial Research & Development to offer technology to India to extract ethanol from various agricultural residues. 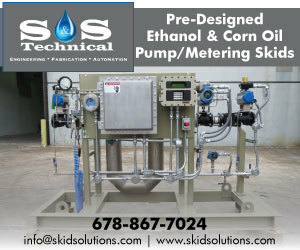 Oak Ridge National Laboratory published an article in Scientific Reports on its new method to directly convert biomass-derived ethanol to a hydrocarbon blendstock and is continuing work with Vertimass LLC to commercialize it. Gevo Inc. announced an update on the certification process for to its alcohol-to-jet product. A meeting of the ASTM D02.J6 subcommittee was held on Dec. 9 to discuss the revision of ASTM D7566 to include alcohol-to-jet synthetic paraffinic kerosene. Members of the global coarse grains, ethanol and coproducts markets will gather under one roof in October at the Export Exchange 2016 in Detroit, Michigan. The event is cosponsored by the U.S. Grains Council and the Renewable Fuels Association. Washington State University researchers have developed a catalyst that easily converts biobased ethanol to a widely used industrial chemical, paving the way for more environmentally friendly, biobased plastics and products. Long-time political commentators Mike Murphy and Paul Begala have been scheduled to speak at the 2016 National Ethanol Conference. They will engage in a point-counterpoint luncheon discussion about the 2016 election. The European Renewable Ethanol Association welcomes the recently COP21 agreement and calls on the EU to make decarbonizing its transport sector a key priority of its actions to meet the COP21 ambitions. The University of Illinois has been awarded a 3-year, $5 million grant from the DOE Advanced Research Projects Agency-Energy as part of its OPEN 2015 funding initiative. The research team intends to increase the water use efficiency of sorghum. Optimism about the ethanol industry’s future is high, despite challenges. This article appears in the January issue of EPM with the headline, "Moving into 2016."